The ACC Hall of Champions celebrates past, present and future conference success through the design and use of interactive displays, unique institutional exhibits and multi-purpose program space that showcases the league’s storied history. The Hall features a combination of content that honors the academic and athletic accomplishments and highlights the ACC’s continuing promise of a “Tradition of Excellence…Then, Now and Always”. Located in the western portion of the Greensboro Coliseum Complex’s Special Events Center, the entrance to the ACC Hall of Champions features a historical timeline of the ACC’s founding in Greensboro, NC in 1953 through today; individual member school exhibits, life-size ACC school mascot exhibits, a “you call the play” interactive broadcasting booth, ACC Network Video Vault and space to display memorabilia, trophies and historical event photos. 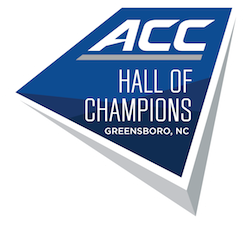 The ACC Hall of Champions further cements the City of Greensboro's lifelong relationship with the ACC and is a dynamic platform to showcase the incredible players, coaches and fans.